Once exclusively for artists, these drums now can be yours. Introducing Music City Custom. The artist experience for every drummer. Pearl is known to produce some of the finest drum shells available today, and our top of the line Masterworks and Reference shells are truly without equal. Our exclusive SST shell forming process is often copied, but never duplicated. 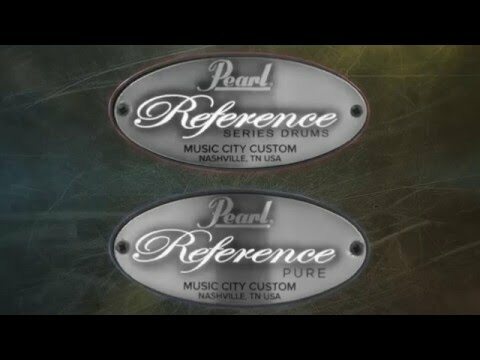 Music City Custom drums features pristine shells of the finest wood plies, manufactured in Pearl’s renowned overseas Masterworks facility, and available in your choice of either Reference (RF), Reference Pure (RFP), or Masters Maple Reserve (MRV) shell specifications. Choose from 36 beautiful covered finishes, and either RF, RFP, MRV shell specifications to experience what our top endorsees have enjoyed for years. Music City Custom RFP Series has 1.6mm FatTone Hoops offering increased strength and articulation. The Music City Custom RF Series MasterCast Hoop system prevents binding and allows the shell to resonate to its absolute fullest potential. Our goal is to complete each Music City Custom kit within 14 business days from the date we receive your order through one of our many authorized dealers. No one in the industry does this. Quick custom manufacturing, together with Pearl’s exclusive lifetime warranty, massive size and color choice selections, and industry-leading craftsmanship all combine to set a new standard. The Reference Pure Series shell recipe uses a combination of task specific bearing edges and 3 time proven woods: Birch, Maple, and African Mahogany. Using Maple as a sole material has long been the traditional choice for shells and for good reason. Maple provides smooth, well balanced tone that is perfect for a 12" tom. Subsequently, all Reference Series 12" toms are composed of 6 thin plies of Maple. The only single wood shell in the series. Our 10" and 8" toms receive 4 thin plies of Maple with 2 inner thin plies of Birch for cut and attack. And for maximum response, all 13" and smaller toms have a rounded 45° bearing edge.